The main objective of this paper is to identify a serious problem for communicators regarding the framing of climate issues in public discourse, namely that moralizing such an issue can motivate individuals while at the same time defensively lead them to avoid solving the problem. We review recent social-psychological research on moral motivation, concluding that moralization is a double-edged sword: It provides people with a powerful motivation to act for a cause they believe in, yet people often cope with moral threats in defensive ways. Fortunately, recent research also hints at possible solutions of this dilemma of communication. One solution involves the non-moral framing of persuasive messages as a means to avoid defensive responses. Another solution revolves around promoting coping mechanisms that do not reflect defensiveness, such as the promotion of value-driven group identities and the development of moral convictions that increase a sense of agency. Finally, we suggest ways to developing change-oriented moral convictions about climate issues. Our findings are of substantial relevance for scientists and policy makers who aim at stimulating behavioural change (e.g., governments’ commitment to the reduction of GHG emissions). 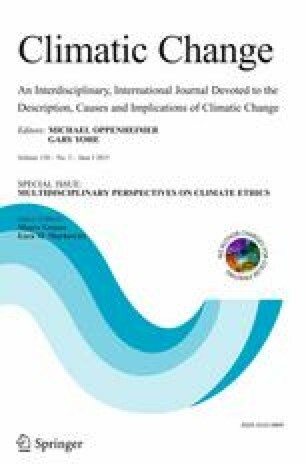 This article is part of a special issue on “Multidisciplinary perspectives on climate ethics” with guest editors Marco Grasso and Ezra M. Markowitz.